Would you ever think of the third largest island on Earth – Borneo (known as Kalimantan in Indonesia) – as one of the cradles of the world’s democracy? Perhaps you wouldn’t, but you should. While Europe was engaged in myriads of internal as well as expansionist wars, in the once lush, tropical Borneo, people who belonged to the ancient local cultures, used to decide things communally, by consensus, or should we use the Western term, “democratically”. Judged by today’s standards, they were also living the lives of determined ‘environmentalists’, showing great respect for the nature around them – for all living creatures, plants, deep forests, wide rivers as well as humble creeks. True, local people – Dayaks – were often marked as “headhunters”, at least by the European Orientalists. But that was only one of many features of their culture. Dayaks spoke at least 170 languages and dialects, enjoying complex fabric of cultures, customs and laws. The bottom line is: in many ways and for many centuries, traditional Dayaks were able to co-exist perfectly well with their island and with the surrounding environment. If left alone, that is what they would still be doing now – living their own lives, in their own place, and most likely, living well. Unfortunately, that was not meant to be. Borneo was attacked, colonized and devastated by European invaders. For a short period, the Japanese occupied the island, and then the Europeans came back again, before “independence” saw the island divided between three sovereign countries: Indonesia, Malaysia and Brunei Darussalam. Things did not get much better. The brutality – almost madness – of the Indonesian plunder which took place after the 1965 Western-orchestrated military coup (backed by foreign mining and logging interests); the plunder of the natural resources of Kalimantan, has been legendary. For Jakarta and for its foreign handlers, the so-called transmigration made looting much easier, while turning local people into a minority and into serfs on their own land. Dayak culture is now only truly ‘alive and well’ in a few untouched pockets in the deep interior. There, people still remember and know how Borneo used to be. They also understand what should and could be done in order to save it. But no one seems to be willing to learn from them, or even to listen. Travelling through the so-called Heart of Borneo (HOB) is not easy. But it is possible, and while collecting footage for our documentary films and for the book, we managed to visit, in May 2018, several remote communities located between the Indonesian city of Putussibau, and the border with Malaysia. Putussibau lies on the shores of the mighty Kapuas River – on its upper stream. Unlike other major cities in Indonesian Kalimantan, it is still mainly surrounded by untouched primary forests, as it lies inside the protected areas. After the almost absolute devastation of Kalimantan that we have been witnessing in western and southern parts of the island for months, the HOB appeared to be remarkably pristine. The inhabitants of various traditional ‘longhouses’ located tens of kilometers outside the city appeared to be very well-informed about the present state of Borneo, and even willing to fearlessly comment on the situation. They were also knowledgeable about the history and traditional cultures of their geographical area, and of the island in general. “We, especially the Dayak Taman (the name of one Dayak sub-ethnic community living in the interior of Borneo), have wisdom and traditions from our ancestors. We know how to live in harmony with the nature. That’s why here we don’t destroy the environment. Without nature, there is no life. We teach our young people, to keep this essential value in their daily existence, and we tell our children not to be easily influenced by the immigrants from other part of the country and from abroad; from those who are coming here and keep devastating Kalimantan. We will also continue to live in this longhouse because we believe that there is wisdom in living in a longhouse, compared to conventional houses. Here we live in harmony with the entire community; we help each other and share our possessions. All important decisions are made after the consultations with the members of our community. “Selling land to the businesses is not a good idea. First, there is never a clear MoU between the companies/government and the local people, so we do not trust them. Second, the palm oil could maybe bring some benefits, but only for the short-term period. But what about our future generations? We don’t want our water to be contaminated, we don’t want to lose our forests – to rob our children and grandchildren of their future. “What about the gold mining?” We ask. It is clear than in other parts of Kalimantan, the ‘illegal’ (although in reality fully protected and even sponsored by the government, police and the military) extraction of gold from the rivers and shores has already poisoned entire communities and waterways with mercury and other highly toxic substances. We want to know about the “democratic principles” that have been governing the local communities and dwellings (like longhouses) for decades and centuries. Democracy. ‘Rule of the people’ in Greek. It is officially promoted by the West, but in reality, it disappears, is immediately blocked from being practiced in the places that are conquered and colonized by the Europeans and their offspring. In Borneo, there was the LanFang Republic. “The Lan Fang Republic was the first democratic republic in South East Asia, set up by the Hakka Chinese in West Borneo. Founded by Luo Fang Bo in 1777, the Republic existed for 107 years with 10 presidents until its reigns came to an end with the Dutch Occupation in 1884.The Chinese first came to Borneo as gold miners and formed various clans grouped by the area of their origins. Originally known as Lan Fang Kongsi (Company), Luo Fang Bo united all the Hakkas in the area to form the Lan Fang Republic. We drove with Mr. Hendri all the way to Ensanak Village, some 200 kilometers from Putussibau. There, again, oil palm plantations are covering enormous sprawls of land. “Protected areas” are far away from here. As everywhere else in the Indonesian Kalimantan, the creeks passing through these plantations are dark red or black from the carcinogenic chemicals that are used by the companies. Mr. Hendri wanted us to talk to his relative, Mr. Mawan, who used to be a true firebrand activist, fighting against the oil palm plantations. He even used to block the company trucks and to initiate legal cases on behalf of the local communities. But after the long and arduous journey, Mr. Mawan was unwilling to speak about the terrible ordeal of the local people. His tiny village was fully encircled by the plantations. There was no tiniest piece of pristine land left, in a radius of tens of kilometers. Yet he spoke about the benefits of the oil palm plantations, not about their devastating effects on the people. Putussibau may be in a somehow better state than other provincial cities of Kalimantan, such as Sintang (a city badly devastated by nearby gold mining). But even here, the situation for the local people is pitiful. The collapsing giant – Indonesia – is still somehow surviving because of the unbridled extraction of natural resources from Papua, Sumatra and Kalimantan, but it gives very little (or close to nothing) back to the people inhabiting these islands. Indonesia is now the world’s largest producer of palm oil in the world (over 21 million tons), Malaysia being close second. This business generates incomes of tens of billions of dollars. Yet the native population in Indonesian Kalimantan remains dirt-poor. 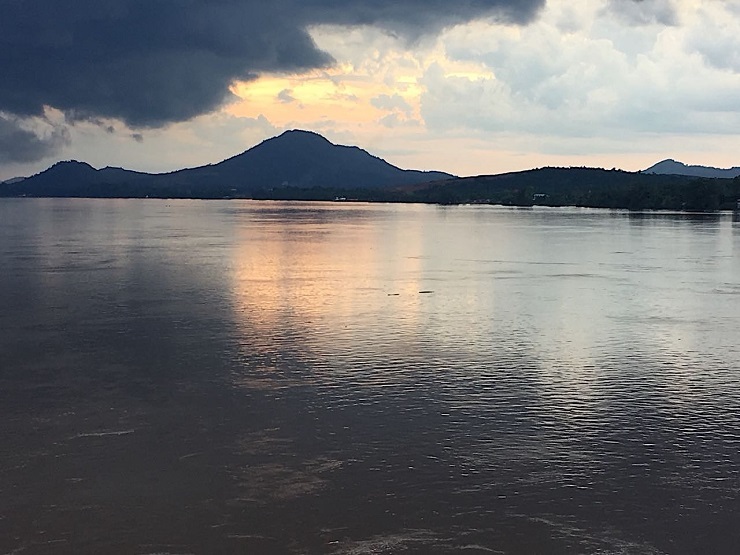 In the evening, before leaving Patussibau, we crossed the river from the city center, to the area which was recently devastate by a landslide – Kedamin. There we saw a parcel of land which literally broke in half, one part remined standing on the hill, while the other one collapsed and fell down to the river. The house was gone. There were only some debris left. The owners of the house – a man and his wife Yeni – were sitting on a makeshift bench shaded by what was left of a tarpaulin roof. At one point, the woman began to cry. Now she and her family have to rely on the help of neighbors and relatives. One of the neighbors had offered them a temporary shelter. As always in such situations, the government did close to zero. It did not asses the danger before the tragedy occurred, it did nothing to reinforce the shore. After the family became homeless, it only offered one-time ‘relief’ – a blanket! Local people can count on nothing. There is no place they can turn to when they need help. Everything has been taken away from Kalimantan, but nothing is being given back, with the exception of some “infrastructure” – meaning roads, which are built in order to facilitate even the greater extraction of the natural resources. Not far from where Ms. Yeni was sitting, a man was defecating into the water, crouching on the jetty behind his house. A few meters down the stream, someone was washing clothes, and then bathing. Clearly, in the cities, not much is left of the former glory of Borneo, and of the deep and proud Dayak culture! Had it not been attacked, colonized and enslaved by the Dutch, British and Japanese invaders, had it not later been taken over by tremendous greed and Machiavellian politics streaming from Java, the island of Borneo would have most likely developed into one of the most traditional and at the same time, prosperous parts of the Southeast Asia. Here, when left alone, both Dayak and Chinese people were co-existed peacefully. Both cultures had their own, democratic ways of governing. Both respected the nature. But both were too weak to fight the superior weapons and unbridled greed of the invaders. They were defeated, humiliated and forced into submission. We know what followed. It is clearly visible all over the island: almost everything is burned, mined out and destroyed. The misery in which the people are forced to live, is appalling. In the old longhouses, deep inside the forest, people still resist, by living their lives as they did before the occupation. 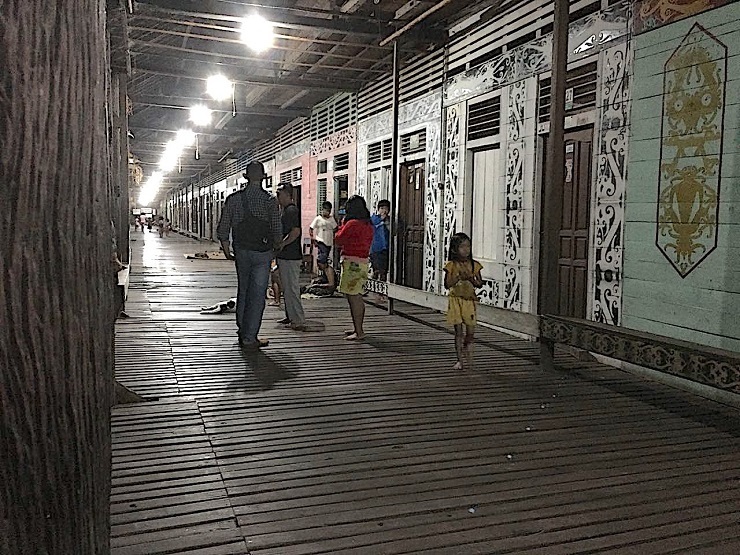 Inside those splendid longhouses, can be found the secrets of Borneo, as well as the answers to those countless questions, including the most burning of all: “why the disaster has taken place”. There, in the minds and hearts of the local people – those people who are still able to resist the mainstream ‘education’ imposed from Jakarta and from abroad – may also lie solutions, the way forward and the salvation for this once most beautiful island on Earth.